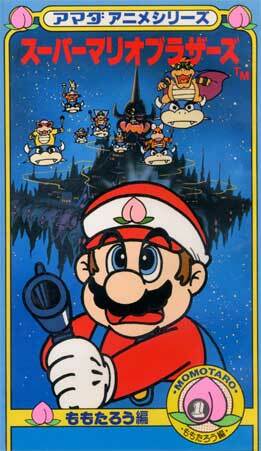 Super Mario Bros. (Amanda series) is a collection of three OVAs featuring the Super Mario Bros. series. Each OVA tells the classic tales of Momotaro, Issunboshi and Shirayukihime (Snow White), except done with Super Mario Bros. characters and a few other changes. In Momotaro, an elderly Hammer Bro. couple who had a granddaughter named Peach. One day, their granddaughter is kidnapped by Bowser, as an evil ogre and his underlings (the Koopalings). While they grieve for her, a peach falls from the heavens which ends up becoming Momtaro, played by Mario. The Hammer Bro. couple takes him in and raises him. When he hears about the story of the kidnapping, he decides to rescue Peach himself. So his 'parents' give him a gun that was passed by generation by generation to aid him in his quest. In Issunboshi, another elderly couple find a tiny-teeny child, named Issuboshi, who is played by Mario. They take him in as their own child. But as he grew, he strangely remained the exact same size. One day Mario moves out of his home, and sails on a tiny boat to the world unknown. He meets Peach and they become friends. One day, they meet Bowser who decides to harass Peach. Mario defends her but is gobbled up by Bowser. How will Mario get out of this one? In Shirayukihime (Snow White), this OVA follows the basic story of Snow White. Peach plays as Snow White while the Toads play as the seven dwarfs. Boweser, oddly enough, plays as the very ugly wicked queen. Peach is poisoned and Mario comes along to save the day. But instead of kissing her, he uses medicine to wake her up. Mario goes on a vengeful rampage and beats up a lot of Koopas to find the wicked queen. Eventually Peach is held as a hostage by knife-point, and all doesn't look so good now. All three OVAs come in separate VHS. It is unknown if these OVAs have came on DVD or ever will for all that matter. The Mario Bros - This site has like everything you ever wanted to know about Mario.